One could only expect such an inaccurate, error-ridden and ridiculous account of the Great Game rendered by Deep State’s Council on Foreign Relations. Throughout the nineteenth century, Great Britain was obsessed by the fear that one of the other European powers would take advantage of the political decay of Islamic Asia. At first it was France. Then it was Russia that moved along the caravan routes of the old conquerors and threatened to establish a new world monarchy on the ruins of the ancient ones. British governments were worried by the implications of the continuing march southward by the Russian empire in Asia. In the early part of the century, the focus of strategic concern was Constantinople. Later, as czarist armies overran Central Asia, attention shifted to Persia, to Afghanistan and to the mountain passes of the Himalayas. By the last quarter of the nineteenth century, it was a common assumption in Europe that the next great war-the inevitable war-was going to be the final showdown between Britain and Russia. The history of Russia’s attempt to move into Afghanistan, Iran and other neighboring countries; of how Britain tried to stop Russia from doing so; and of how the war between the two of them did not take place, gains interest and possible significance from the American decision in our own time to contest Russian expansion on much the same battlefield. Supposedly it was a British officer who first called it the Great Game. He played it exuberantly, and lost it in the terrifying way in which one lost in Central Asia: an Uzbek emir cast him for two months into a well filled with vermin and reptiles, and then what remained of him was brought up and beheaded. 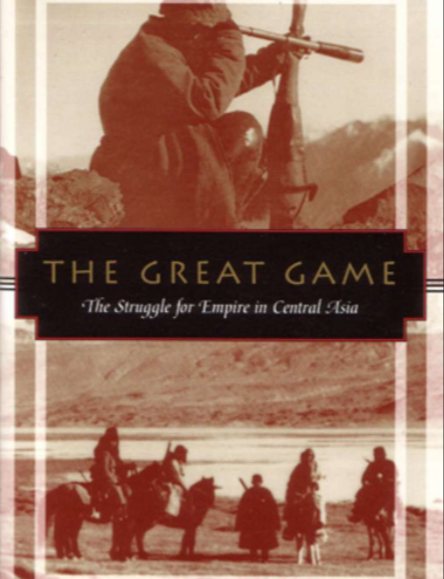 The phrase “the Great Game” was found in his papers and quoted by a historian of the First Afghan War. Rudyard Kipling made it famous in Kim, and visualized it in terms of an Anglo-Indian boy and his Afghan mentor foiling Russian intrigues along the highways to Hindustan. These activities of the rival intelligence services are what some writers mean by the Great Game; others ….